Discussion in 'Wheels and Tire Upgrades Sponsored By Tire Rack' started by dvlsfan30, Sep 11, 2014.
got a 2014 sedan si i am looking to lower with buddyclub coils when they are available for the 14.
i have decided on Black RPF1s, i know my car has 18's but im not crazy about how big 18s are on the civic. i like the look of 17s and have been flip flopping around on width. couldnt decide on 8 , or 9. i love the look of the 9 but dont want to roll fenders or camber out. would 18x8.5 fit close to flush with the fenders and not require a roll? i like the look of the flat spokes on the rpf1 but you only get that on 9 inch width. im also confused about offset. what would look more aggressive 30 or 40mm? i want to run buddy club brake calipers so clearance is in mind too. any help is greatly appreciated as in i know nothing about offset really. im not looking to stretch really either! 9" rpf1 is definitely a different look. Quite a few users have the 9" rpf1's on their car. It all depends on the offset, and how low you plan on going. webby and Nix like this. do you think i could get away with 17x8.5 without rolling if i lowered on the coils? what would be a nice tire without stretching? @team3d - Great info! Question: Why does the 17x9 not clear the caliper? Does it have to be a particular offset or is the difference in the wheel shape that reduces clearance on the backside? Probably depending on the offset. Get the +40 to be safe and also leave yourself room to run a big tire if you wanted to. You could do either a 225/45/17 or a 235/40/17. The wider tire is a little short compared to stock but gives you the largest contact patch and a slightly smaller sidewall. Best option for performance but not ideal if you are driving a ton. The 225 on an 8.5 will fit really nicely too. can you run 17x9s without rolling fenders if i lowered it? People have but it really depends then on offset, tire size, how low is "low enough", and camber settings. So technically yes. The +35 and a 215 or most likely a 205 tire would make it. I don't like the idea of stretched tires myself and the narrowest I would suggest running is a 225 width. You will most likely rub with that though. I don't like stretched tires and I don't like camber over -2 degrees. That's just me. Where are you located? If you're anywhere near Louisville KY, I would be happy to help you roll your fenders. im in new york, and would love the help if i was out there. im just nervous having someone roll the fenders that they will get damaged in the process. i have seen what they can turn out to be if a shotty person does it. i dont want to stretch either. NY eh? What part? NYC or Upstate? With 17 vs 18 if you maintain the correct tire size the car will not be any lower to the ground. You will keep nearly identical outer diameter, which keeps your speedometer accurate, and your mileage accurate also. A 17 will only be lower than an 18 if you make the sidewalls the wrong size. You can run either size wheel and keep that gap the same depending on tire size. Do you have a coupe or sedan? I generally think coupes look fine with 17s but I like the look of an 18 on a sedan. The body size is larger and I think the 18 just "fits" better. The rpf1 looks totally different in a 9" width than an 8 or 8.5, be certain you are getting the wheel you want. Bubble face vs concave/flat face spokes. Also, I'm from Syracuse and I'm up there occasionally. If you were closer I'd say we could meet up and get your fenders rolled for you. i appreciate it man , unfortunately im an hour and 40 min south of albany. what would be a safe, good tire size for the 17x8.5 without worrying about rubbing or stretching? 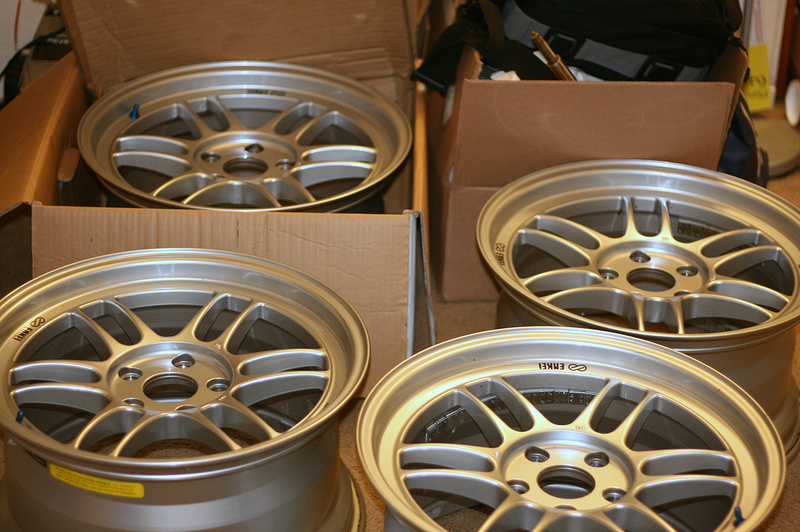 im guessing the 18x8 the stock size tire would look nice on the 18x8 rpf1. it looks good on the stock rim in my opinion. On 17's run a 225/45/17 but, if you went to 18's get a 225/40/18. It fits nice and maintains the correct outer diameter. Be sure and look at what I told you about the different widths with that particular wheel though ok? This is a 17x8. See how the spokes "bubble" out? And this is 17x9. Watch how different the wheel looks. It's the same whether 17 or 18". Seriously google both sizes and make sure you are getting what you want. The wheel looks completely different from 8.5 and 9" wide. That half inch is the biggest change of any wheel I know. i am starting a new job for the railroad the 24th and even though i will be taking the train, i will need to commute to some places during training. im either going to go 18x8 or 17x8.5 (if i can figure out a tire that wont slighty rub) i guess i got time since the buddy clubs aint ready yet and i wouldnt want to throw them on without lowering the car at the same time while its in my friends garage.